Please note that the Recruitment Assessment Day has now been phased out of the prison officer recruitment process and has been replaced by the Assessment Recruitment Centre (ARC). Please read this blog post to see how best to prepare for the ARC. If you applied to a job before 15 October 2018 and have already been invited to attend a RAD, this will continue. The change only affects people who applied after 15 October. For more information on this, please refer to our blog post: The Recruitment Assessment Day (RAD) is changing to the Assessment & Recruitment Centre (ARC). Part of the application process to become a prison officer is to attend and pass a Recruitment Assessment Day (RAD). A RAD is not like a typical assessment day or job interview, as it specifically assesses an applicant's suitability to be a prison officer. I’m a Recruitment Adviser for Her Majesty's Prison and Probation Service (HMPPS), and my role is to provide help and guidance to prison officer applicants. We get many questions about the RAD in particular. So, I’ve written this post to provide tips on what we’re looking for in prison officers, what to expect and how to prepare for a RAD. Prison officer applicants will need to complete and pass the Online Prison Officer Selection Test for each prison they’ve applied to. Once passed, applicants may also be invited to attend a familiarisation day, so they can get to know a prison better and also check they’re a right fit for the role. You’re then invited to attend a RAD. Even if you’ve applied to multiple prisons, you only need to attend and pass one RAD. You’ll be able to book onto any available RAD within the next 3-4 weeks after being invited. You’re able to choose which RAD centre you go to, so you should be able to pick a RAD slot that is at a convenient time and location. There are no formal interviews at the RAD. The RAD assessors will be looking at your suitability to become a prison officer by seeing if you have the values, fitness (stamina) and interpersonal skills needed for this role through a series of tests. The RAD includes a basic medical test, including an eyesight test, with and without glasses (so if you’re a contact lens wearer, you’ll need to also bring your glasses with you). Your blood pressure will be taken, and we advise you to not drink caffeinated drinks which may affect your blood pressure and, if it’s too high, you won't be allowed to take the fitness test. There will be a literacy and language test, and a numeracy test, but don’t panic – you’ll be able to use a calculator. Prison officers will be expected to be able to write accurate and easily-understood case notes and reports. This brings me onto what the prison officer fitness test involves. You’ll need to pass a bleep test at level 5.4. This means running and keeping in time with the bleeps, until you hear four beeps past level 5. You’ll also do a shuttle run, a grip test and shield test (where you’ll need to show you can hold up a shield for a set period of time). The tests are all about how you manage your interactions with others, so think about body language, ask (the actor) questions, show resilience and that you understand the situation. Most importantly, remember to be yourself. What to wear at the RAD? There's no official dress-code but we recommend attending in smart-casual clothes. Take your gym kit along as well, including any medication such as inhalers, for the fitness test. Remember you also need to bring original documents that prove your right to work, a valid ID and proof of your address. You’ll be given guidance as to what documents to bring when invited. You should receive your results within 5 working days. If you pass the RAD, congratulations! Following the good news, you’ll then begin the vetting clearance process, which will take approximately 12 weeks. 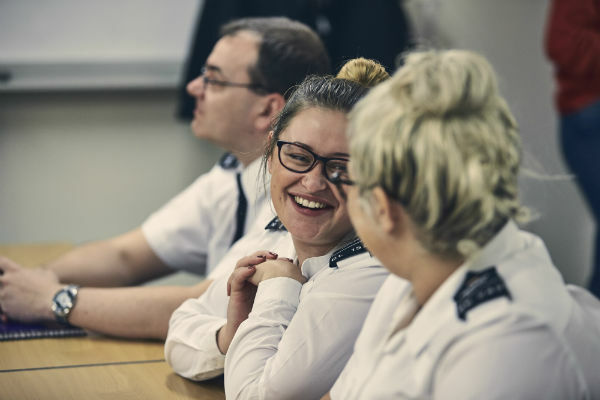 Once completed, you’ll be invited to attend your Prison Officer Entry Level Training (POELT) – a 12-week training course that provides new recruits with the skills and knowledge needed to start their career as prison officers. If you’re unsuccessful but very close to the pass mark, then you’ll be invited back to attend a development day and offered another chance at the RAD. You’ll be given some training in the area you didn’t pass (such as numeracy, literacy, or the role-play), and then get the opportunity to take another test. You can attempt the fitness test a total of 3 times as long as you’ve passed all other tests. If unsuccessful across the whole assessment, you’ll still always be welcome to re-apply to a new job vacancy when advertised. To find out more information about working for the prison service, please visit our recruitment website. Please note that the Recruitment Assessment Day has now been phased out of the prison officer recruitment process and has been replaced by the Assessment Recruitment Centre. So I've just recently passed my RAD, I applied for an Officer role at Rochester, but I've also applied for a number of other local facilities. I've read that I only need to pass one RAD, so what happens regarding the other places I've applied for? Am I eligible for a position at these too? Is there a way I can update the Prisons I'd like to work in, to include these? Sorry, a burst of questions there. Thanks for your questions. Congratulations on passing your RAD! You'll now need to make a decision on which application you'd like to move forward with, and withdraw from the rest. You won't be able to take forward more than one application with the same RAD result. If you wish to move your RAD accreditation to another establishment, you'll need to please phone the recruitment contact centre at SSCL. I just passed the online test for prison officer.Waiting for a slot to become available, just worrie about the chance i will have or not because of my age,i am over 50.Of course in case i will pass the RAD.What do you think?Thank you,Florica. There is no upper age limit to become a prison officer; you just need to be able to pass our tests as described in the above blog post. Thank you!I am trying to do my home work!I understood that,is not going to be easy!I 've been invited to a familiarisation Day,the slot choosed is in September. Is after that day,if I am successful, is going to be the RAD day i understood. Is that correct? Yes - the familiarisation day is a chance for you to get to view the prison and the days are booked depending on availability. Hi. Congratulations for past your test. I ddnt have time enough to finish, so I ddnt passing this time. Could you let me know if is there any where I could find this kind of test to practice for the next time, please? How long will the RAD continue? RAD stands for Recruitment Assessment Day, so it'll last a day. Recruitment Assessment Days are run on a continuous basis and you'll be provided with a series of dates to choose from if you're invited to book onto one. I am about to do RAD , I'm as prepared as i can be if i was to fail can i do it again or do i have to wait a certain length of time before i can re do it? Best of luck on your RAD! It depends on what margin you've failed the RAD. If you’re unsuccessful but very close to the pass mark, then you’ll be invited back to attend a development day and offered another chance at the RAD. You’ll be given some training in the area you didn’t pass (such as numeracy, literacy, or the role-play), and then get the opportunity to take another test. You can attempt the fitness test a total of 3 times as long as you’ve passed all other tests. I am about to do my RAD tomorrow. I have multiple applications submitted and have another RAD booked in for 26th March. If i am unfortunate enough to fail tomorrow, will i be able to simply do the RAD on the 26th, or alternatively if i pass everytning except the fitness test tomorrow, can i re-do the fit ess test alone on the 26th? Thanks. I hope your RAD went well! If you’re unsuccessful please keep an eye out for any communications from HMPPS, who’ll be in touch with you to discuss the next steps. Hi all, I have passed RAD and also medical assessment. When should I order my uniform and how do I do it? Congrats on passing! You'll receive your uniform on your first day of the job. If you have failed the literacy test by one point and everything else was passed. How long do you have to wait to retake that element? what kind of medial do you undertake ? I have had operations on my knee however i am able to play sport etc and run as normal, will my past medial record of knee opportunities effect my chance? Please refer to the blog post on this page, as we explain that it'll be a basic medical test testing your eyesight and blood pressure etc. The blog post also explains that you'll need to be able to pass a fitness test, which is a bleep test at level 5.4, and provides examples of how you can practice this ahead of the RAD. You should’ve received the medical consent form as an embedded link in the invite to RAD email. Could you please double check your email and let me know if you haven’t received this? Hi! I passed my RAD earlier this month, i passed every element of the assessment and also received good grades in the practical test (all A's and two B+'s). I sent off the OH questionairre a few weeks ago, and i now understand that i have been placed on a merit list and that i will need to wait for a vacancy to arise in my chosen prison. I am wondering how long it will be until i find out what time period i will be waiting until i start the vetting process. I have applied to a large prison so i hopefully wont be waiting for too long, but any information regarding this will be really appreciated because i don't know whether to look for temporary work in the meantime or to find a full time job now (if the process takes more than 6 months). I’m afraid we’re not able to advise on how long you’ll be on the merit list for because it is dependent on when a vacancy opens up at the prison you’ve applied to. However, you are on the merit list for up to 12 months from the date you’ve passed your RAD. Therefore, we’d encourage all candidates to remain in work and to not hand in their notice until they’ve received confirmation of an offer and are approached with a start date. Hiya Josh I'm exactly the same suppose it's just a waiting game.. were did you do your RAD? What date did you do it? I recently had my RAD and was accredited for adult prison but was unsuccessful for adult juvenile prison. On my RAD results it says that I can still work in adult environment, I applied for the prisons Pentonville and wormwood scrubs which I both thought were adult prisons. Can I use these results to still progress to work in the two prisons mentioned? If not, can I use them to work in other prisons without having to apply again from the very start and wait another couple of months to hear something? You can mirror your RAD results from one prison to another, but you’ll need to pass the online tests for both HMP Pentonville and Wormwood Scrubs and then ask for your RAD results to be transferred over. To transfer your RAD results over, please call the recruitment contact centre on 0845 241 5358 and they’ll be able to help. Thank you Helena took up your advices and used the RAD results for pentoville. Just waiting on my vetting to now come through. Thanks for your help! Does this mean I will be invited back or am I not near the pass mark? I'm afraid I'm not going to be able to discuss specific details about your RAD results on this public blog. Keep an eye on both your emails and applicants portal to find out next steps. Please refer to the blog post on this page as this tells you details about the bleep test for the RAD. I completed my RAD 27th March but still haven’t heard anything. I have also sent an email enquiring, but no reply. Can I assume I haven’t been successful? It can take some time to hear back, please keep checking your applicant portal. Thank you for your patience. I have been invited to a familiarisation day on the 20th of April, if all goes well i will be invited to the RAD within the next 3-4 weeks, unfortunately I will be holiday for 3 weeks from the beginning of May. Is there a chance to join a RAD day after the 3-4 invitation or would I have to start the process again? You’ll be given a selection of dates and locations for the RAD, so you can book onto a day that doesn’t clash with your holiday. I passed my RAD on Tuesday and still being early days I haven't heard anything apart from an email regarding a health form to complete online. I think I have completed it but it's asking about immunisations and the form is quite difficult. I'm not sure what sections I'm supposed to complete? Congrats on passing your RAD! It can take some time to hear back, please keep checking your applicant portal. If you’re struggling with the health form please contact the prison you’ve applied to and ask for the People Hub - they should be able to help you. Hi my RAD day is fast approaching and im a bit worried about my blood pressure being high. I'm on tablets but i also suffer with white coat . will this be taken into account ? Best of luck for your RAD! When you arrive at your medical, please let the RAD assessors know about your medical history. I’ve passed my rad, and been told I’m on a reserve list for my chosen prisons, when I applied it was a pass campaign and is now a merit. I’ve been placed on a reserve list is this the same as a merit list? What would be the rough wait for a vacancy? Also can my rad results be used for other prisons? Congrats on passing your RAD! The reserve list is also known as a merit list, you can read more in our vetting blog post - https://prisonjobs.blog.gov.uk/2018/03/22/prison-officer-vetting-101/. As per the blog post, you can remain on the merit list for up to 12 months. You can transfer your RAD to another prison if you pass the online test for each prison you’ve applied to. You can then transfer your existing RAD accreditation if you wish (you only need to take one RAD) to the new application. Hi, I am due to take RAD on 11th of this month. Just worried about the bleep test. If I fail the bleep test but pass the rest of the tests what are my chances of being selected to the prison officer role? Best of luck for your RAD! Please review the above blog post where we provide information on the bleep test. You can attempt the fitness test a total of 3 times as long as you pass all the other tests on at your RAD. Hi. I had my Rad yesterday. I know it could be to soon for the results just yet. However when i log in to my account to check my application progress it shows: Aplication update and only the button that says "withdraw the application. Does that mean that i have been unsuccessful at Rad? That button provides you with the option to withdraw your application if you no longer wish to apply. It is always available to applicants, should they change their mind during any stage of the application process. Please keep an eye on your emails and application portal. You should receive your results within 5 working days. Hello. Got my rad results today and looks like i passed everything, except failed literacy test by 2 marks. Will i be invited back to a development course? As we were told if you close to passing in one area by 2 marks that we will be offered a re-sit? Yes, as per this blog post on the RAD, if you were close to the pass mark you’ll be invited back. Please keep an eye on both your applicant portal and emails. Hi, I've been offered to attend a RAD after completing my online application on trying to book a slot where iv been offered are all really far away from I live is that the only choice I have to pick from? If I pass the RAD is that the same location(s) that I would be offered to do the poelt as having 4 young children I couldn't be away from home Monday to Friday for 10 weeks, Thank you. The location where you’re taking your RAD might not necessarily be the same location you do your POELT. For both RAD and POELT we have to allocate people to the spaces we have available, but we always try to take into consideration your location, the prison you’ve applied to and your personal circumstances. Hello, I passed my RAD last month, initially applying for HMP Bedford. I have completed the online health questionnaire. I see on my portal that I have already been placed on the waiting list for Bedford. I assumed there would be vacancies, hence the advertisement for applicants. Is it just a case of waiting for vacancies now? I have since applied for HMP Woodhill and have a Familiarisation Tour on the 20th April. However, I'm worried that I'll be placed on the waiting list again for this prison. Is there a way to see what prisons have vacancies? Thank you. Congrats on passing your RAD! Some prisons advertise roles stating whether or not they’re recruiting on a merit basis from the beginning of the process. However, depending on the quality of candidates and number of vacancies available, some prisons may end up having to recruit on a merit basis after the application process has started. Once you’re put on a merit list, unfortunately it’s not possible to tell when a vacancy will arise or how many vacancies a prison has as they recruit on a rolling basis. As soon as a vacancy opens at HMP Bedford they will be in touch with you. I have my RAD on Thursday, I emailed Noms recruitment regarding my identification and have had no reply. I currently only have an expired passport and short birth certificate. I have been unable to get updated/full copies with short notice. I have a full driving licence, marriage certificate, my children's birth certificates and a current DBS and several proof of address documents. will this be sufficient for the identification and address proof requirements. Best of luck for your RAD! I’d encourage you to just take all your documents along with you to RAD. Although your passport is out of date, you may still need it as photographic ID to get into the prison. You should receive a text 48 hours prior to your RAD along with a contact number which you can ring if you have any queries. I have my RAD on the 19th April. I am worried about the eye sight test. I currently where glasses all the time and can see perfectly. As I wear glasses all the time, Is there a minimum requirement without glasses that I need to meet? Best of luck for your RAD! You need to meet a minimum standard in both eyes of not less than 6/36 in each eye on the Snellen scale (uncorrected) and not less than 6/12 in the best eye (corrected with glasses/contact lenses if necessary). You also need to have normal binocular field vision with at least 120 degrees of vision in the horizontal plane. I’m finding it so difficult to pass my situational judgement test. Anyone to give us a clue please? I’m afraid I can’t go into too much detail on how these assessments are marked on this public blog. I’d encourage you to take a look at the practice material we’ve provided - https://www.youtube.com/watch?v=MrzeX4RUpxM. As per the blog post, you won’t be expected to solve the problem but demonstrate how you’d manage the situation, so think about how you manage your interactions with others, think about body language, asking (the actor) questions, showing resilience and that you understand the situation. I hope that’s useful and best of luck. Hi I recently passed my RAD where I applied for a position at Bedford. I received an email to say I was waiting to be appointed and put on the merit list but when I logged on to the portal it said I had not been appointed as there was a high calibre of strong applicants (bearing in mind I achieved all A's/A+s). I'm finding the process overall a bit confusing as there is multiple adverts for the vacancies but it looks like there is no jobs. Congrats on passing your RAD! From the information you’ve provided, it appears that you’ve been placed on the merit list. There are still candidates going through the assessment process so not all vacancies have been filled as of yet. Once the merit list order is confirmed, HMPPS will be able to make job offers as vacancies open up throughout the 12 months waiting list. I have my RAD next Thursday and I’m worried I might fail the fitness aspects as my left hand is in a cast (ie grip strength, push/pull). Is it possible for me to reschedule the RAD to a time when I know my cast will be removed? Or is it worth going and trying next week, and if I do fail my fitness I can come back and retake it? It’s best to call the recruitment contact centre on 0845 241 5358 to discuss this query as they’ll be able to help you and possibly reschedule onto a later RAD date. I have a familIsation day on the 20th April. Should I be worried about this and what can I expect? I am just a bit wconcerned that they might think I’m not fit for the job and not put me forward to the RAD. How do they asses that on that day ? Best of luck for your familiarisation day! Familiarisation days are nothing to be worried about, they’re organised so that you can get to know your work environment. The visit also gives you a great chance to meet serving prison officers and see what it’s like to work in the prison. Due to this being a public blog, I can’t go into too much detail on how they assess on the day. If applied online and was unsuccessful with SJT and Maths test, can I reapply or do I have to wait? You’re unable to apply to the same campaign if you’ve failed the online test. You either need to wait for the campaign to be re-advertised at a later date or you’re more than welcome to apply to a different prison. For both RAD and POELT we have to allocate people to the spaces we have available, but we always try to take into consideration your location, the prison you’ve applied to and your personal circumstances. Please refer to the prison you’ve applied to regarding travel expenses as each prison differs. I took my RAD test yesterday I felt it all went well I defused all the scenarios efficiently and I felt there was no problems with that. I failed my maths test by 4 marks but I passed the English. Just don’t know why how I failed the scenarios as I felt confident throughout. It’s Upsetting as I really want to give it another hit again. You are more than welcome to apply to a different prison or you can wait until the prison you’ve applied to re-advertises positions at a later date. Hi I have my familiarisation day tomorrow and was wondering if there was a specific dress code for this. There is no official dress code, smart casual is fine. Please don’t wear anything with offensive logos, full of rips etc. You will be walking around prisons, so make sure you wear comfortable footwear. I was having some trouble with booking on to the RAD closest to my home, the link would not allow me to confirm the date and time. After emailing the SSCL Recruitment Centre about it and having no reply, I attempted it again and now the only ones available are miles away. Shall I take it that I now need to attend one of the ones that are further away in order to secure a slot? I’m sorry to hear you’ve had trouble booking onto your RAD. Yes, I would encourage you to secure your place on one of the RADs available. Hello I have my RAD booked for Monday in Rugby. I was wondering if its possible to just wear some joggers and a top and trainers so im ready for the medical without needing to change, would this be ok? Or would it be better to wear something smarter then get changed into clothes for the physical tests? Best of luck for your RAD on Monday! There is no official dress code, we do encourage smart casual. If you feel comfortable wearing jogging bottoms, a top and trainers then please feel free to wear this to your RAD. Im doing my RAD this week for a youth custody prison officer role, hoping all goes well and i pass would i be to relocate to a different prison using the same RAD with it being a young offenders prison to an adults prison? Also my RAD is down london and i live in the north east, ive been advised that ill be to claim back expenses? Best of luck for your RAD! You can transfer your RAD from a youth custody role to an adults prison officer role. Please call the Recruitment Contact Centre on 0845 241 5358 to discuss your application. Yes, you can claim back expenses. Please call the prison you’ve applied to, as expenses differ for each prison, and they’ll be able to assist you. Is there any assessment involved on the familiarisation day? Or just an overall idea of the prison work environment ? No, there are no assessments at the familiarisation day. The visit allows you to see what it’s like to work in a prison and also to meet prison officers. I attended my RAD on monday and was not passed to do the pyhsical part due to an injury. If I pass everything else will I be able to take the fitness at a later date? is there a specific time limit i have to do it in ? Yes, as per the blog post you’ll be able to retake your fitness test a total of 3 times as long as you’ve passed all the other tests at RAD. Your fitness is valid for 12 months and still needs to be in date once you’ve completed your 12 weeks POELT training. How many people are invited to a familiarisation day? and what can you expect from this day? The number of people attending a familiarisation day depends on the prison you’ve applied to. They’re organised for you to see what it's like to work in a prison and also gives you the chance to meet prison officers. Hi I’m 17 years old and I passed my online application I’m just wondering if I can attend my RAD or do I have to wait till I’m 18 to book my RAD ? Please ring the SSCL Recruitment Contact Centre on 0845 241 5358 to discuss your query as they’ll be able to help you. Congrats on passing your RAD! You’ll be able to tell if you’ve passed vetting by logging into the online applicant portal and seeing if your status has been updated to say that your pre-employment checks have been successfully completed. Please keep an eye out for any communications from HMPPS, who will be in touch with you to discuss next steps. Contracts are emailed out and you’ll be asked to accept via email. As per the blog post, you’re able to retake your fitness up to 3 times if you passed everything else. You’ll be contacted by HMPPS to complete your fitness test so please keep an eye on both your applicant portal and emails. Hi, I passed my RAD August last year. In January I got passed fit to work by OH assist but I’ve had no provisional job offer and when I call recruitment they say I’m still on the merit list. So my question is, what stage am I upto and is this a common process? As per this blog post, https://prisonjobs.blog.gov.uk/2018/03/22/prison-officer-vetting-101/, you’ve been put on the merit list as the prison you’ve applied to has filled all their vacancies. You’ll remain on this list for 12 months from the date you passed your RAD. I passed my RAD day and have now been placed on a merit list. I was told at my RAD day to order my uniform as soon as I found out I passed. However, because I am on a merit list I’m not sure if I need to do this? No need to order your uniform yet, once HMPPS have offered you a position they’ll send you all the information you need to know including how to order your uniform. Hi, next week I am attending a RAD for an application to a prison, however I am also intending to apply for another prison if they open up for any applications soon. If I pass this RAD, would I be able be to then apply to this other prison on the back of this RAD. You’re unable to retake the online test for that particular prison. You can apply to other prisons or wait until the campaign of your original prison closes and reopens at a later date. I had my RAD on 21st April at 8am in Rugby and had to stay over and travel up from Teesside as it was the closest available assessment to me. I was wondering how long the expenses take to come through? Please ring the prison you’ve applied to and they’ll be able to help you as it differs for each prison. You’ll be able to bring a calculator into the maths test with you. Hi. I've been invited for a RAD, but it's in Warickshire. Are there any other locations? I'm in Yorkshire but it's the only centre they have offered. Hi, I just found out I’ve passed my RAD yesterday. I’m a bit confused about my uniform ordering. It stated at RAD yesterday to order as soon as we find out we’ve passed. However, the form is asking for start date etc and I don’t know this. Can you shed any light please? Congrats on passing your RAD! It’s fine to leave that part blank for now. I’d encourage you to keep hold of your uniform form until you’ve received a provisional job offer on WCN. Your start date won’t be agreed until you’ve completed your vetting (pre-employment checks). I've recently completed the RAD for adult prisons, and even though I have passed, I've received correspondence that says I haven't been placed even though I was a strong candidate due to the high amount of applicants, and am now on a reserve list. I've now applied for a position for a young offenders prison, and been invited for another RAD. I understand that there are more role plays, but would I have to complete the medical and fitness again? As I passed these two weeks ago on the adult RAD. You can transfer your RAD from your adult prison to your youth offender establishment, then you’ll just need to complete the extra role plays. If you’d rather not transfer your RAD, you’ll need to do the full medical and fitness tests again. Please review the above blog post. When is the last RAD for the jobs available at Holme House? Does the above mean the RAD process has finished and I wasn't successful or the RAD process is still ongoing and all applicants have had this sent to their portal? No, the RAD process hasn’t finished yet but I’m afraid I don’t hold the information on when the final RAD is taking place at Holme House. I also received this message on my portal but my email says I'm on the merit list. I'm a bit confused as one says I've not been appointed and the other says I'm on the merit list does this mean I've been unsuccessful at this stage? From the information provided, it appears you’re on the merit list. You’ll remain on this merit list for up to 12 months until a vacancy comes up. Please refer to this blog post for more information - https://prisonjobs.blog.gov.uk/2018/03/22/prison-officer-vetting-101/. I recently took RAD in Holloway. And today I received the following mail without any specific score. Who can I know my actual scores on each sections. I’m afraid that due to the volume of applicants going through the RAD process, you won’t receive a specific score. I recently passed my RAD and accepted a provisional offer. I have another RAD for a different prison and wanted to know if I could transfer this RAD to that establishment for my vetting to continue there. I was informed at the RAD that it would be possible to transfer the process. Is that information correct? Best of luck for Monday! Please refer to the blog post on this page - it confirms that the assessors will mark you against 7 interpersonal characteristics. I'm afraid we're not able to provide any further information on how you'll be assessed. I had my RAD on the 27th April 2018, thankfully I passed and am currently going through the vetting process. However, I sent off the form for the travel expenses the next day and still haven't received my money. Do you know how long an expense claim usually takes or do you have a number I could ring to speak to someone about it? I'm afraid we don't know this information. Please phone the prison you've applied to as they should be able to help. I have attempted the fitness part of RAD today. I was unable to do it on my initial RAD day due to an injury. I only got to 4.6 on the bleep test. Will i get another attempt or do I have to start the process again. We answer this question on the blog post on this page. Please refer to this, as it'll help with your query. I had my RAD day on 13th June 2018 I have revived an email that I have failed..... I flew through and passed every section apart from English were it looks like I got 3 below the minimum mark! Can I resit this please? It seems such a shame to through all the work away when I scored top marks in everything including A+ in scenarios?? So upset by this and very worried??? I’m sorry to hear your news, I can understand you’re disappointed. As per the blog post, if you fail an element of RAD but are very near the pass mark then you’ll be invited back to resit. Please keep an eye on both your applicant portal and emails. The prison you’ve applied to is still advertising as candidates are still going through the assessment process. As soon as all the candidates have finished their assessment process the campaign will close and the prison will then start offering jobs. Recruitment in prisons is ongoing, including maintaining merit lists, so that we can meet our recruitment needs. Hi, I'm a little confused about the availability of vacancies and how this is communicated. Have passed RAD and filled in OH assessment. I applied for a pass campaign but have now received am update that I'm on the merit list. The pass campaign advert is still live and doesn't appear to have a closing date. Does recieving this message mean that there are no current vacancies at the moment, or do they initially send that email to everyone? Also is there a way to find out your position on the list? We are relocating so will need to finish my current job regardless but it is difficult to make plans without knowing whether I'll be waiting a few days for a call, or many months because there are no current vacancies. The campaign is still live as candidates are still going through the assessment process. I’m afraid there isn’t a way to find out your position on the list. currently awaiting to start my 12 week training in November, recently moved address who do I contact to do this ? I have my RAD coming up in a few days, I currently live in Yorkshire and have applied for a local prison but have been allocated a RAD in London (Holloway)! Is it possible to reimburse the cost of travel and accommodation? Also, I have noticed that there are vacancies in other nearby prisons, should I pass the RAD am I restricted to just working in the prison I applied for or is there a way that let you guys know that I a happy to work at any nearby prison. Hi. I have a question about the RAD please. Could you tell me where the RAD centres are in the U.K? Im in North London and I'm hoping my chosen establishment, HMP Pentonville, will be running it there. Could you also tell me where the centres are in the U.K. for the 10 week training are? Im hoping again HMP Pentonville, if further afield, would my travel expenses be paid and what is the max I would be able to claim on a Monday to Friday for travel expenses. I understand that the 10 week training maybe residential. I'm happy to travel max 1 hour each way on a fast train outside London for my 10 week training. Thank you very much. Cant wait for my Familiarisation Day next week. Exciting! I just passed my RAD & have found myself on the dreaded "merit list". I'm just wondering if my acumen for the role of Prison Guard is going to be judged purely on my ability to feign empathy for the Hollyoaks rejects in the drama class scenarios, or can I trust the recruitment team to have more common sense than that? For example will they actually take into account things like my experience, age, work history (former Commando trained soldier, Afghan Veteran, Head Door supervisor) etc.? Especially since we are dealing with potentially volatile, real life situations & not preparing for a staring role in the stage show musical of Mamma Mia. I ask this because I know I'm well suited for this role & the last thing you guys want to do is attract shirt filler that'll most probably not even make it through the 12 month Probation Period. Yes, everything will be taken into consideration whilst you’re on the merit list including your RAD results. The role plays are designed to prepare and train prison officers for real-life potential scenarios between prison officers and prisoners. Please keep checking the schedule as more dates will continue to be added. Trying to book an interview online but they haven’t any slots available. How long do I have to wait before more available slots become available? Please keep an eye on both your applicant portal and emails, as HMPPS will be in contact with you soon. I missed my familiarization day which was yesterday at Aylesbury prison. Can you kindly advice me how can i rebook another day or do i have apply again. Thank you. Please check your emails and applicant portal as you should’ve received a new invitation for another familiarisation day. I have been invited to the RAD. I am male with shoulder length hair which is permanently tied back. I would like to know if this could affect the assement day result? As per the blog post - https://prisonjobs.blog.gov.uk/2017/12/13/an-introduction-to-poelt-prison-officer-entry-level-training/ we don’t use the word fail, if you find something challenging we’ll work with you to help overcome it. Hi, I have my RAD coming up next week and along the checklist of things to take with me it asks for a medical consent form. I can't find one on the portal or site, will this be something provided to complete on the day? Hi there I’ve passed my RAD and received my results via email. It says “May I take this opportunity of congratulating you on your accreditation at the Prison Officer Recruitment Assessment Day. I passed an RAD on the 24th May and have filled the OH medical survey out two days after, as i received my RAD results the same day. Its now been around 8 weeks since the date i've passed, and i have received a message about an application to Stafford on the portal with the merit list message. However, I went to Stafford in person to hand in documentation needed for the vetting process, around 4 weeks ago. Does this mean i'm 8/12 weeks through the vetting period and the message is potentially temporary and i've maybe got the job after all? Any clarification would be appreciated, thanks. Congrats on passing your RAD! Apologies for the delay in my response. I’m afraid I don’t know where you specifically are on your recruitment journey. Please email the PORRP team - PORRP-VAT@noms.gsi.gov.uk as they deal with questions related to vetting. I attended a RAD over 2 weeks ago at which time i sent off a travel expenses claim. I have not heard anything regarding receiving payment for my fuel. Please can you advise who i can chase this up with? Please get in touch with the prison you've applied to. Hi, quick question about the eye test. If you wear lenses at all times , are you expected to have part of the test without them ? Yes there is a test for both with and without visual aids - please refer to the blog post on this page as we explain that here. Hi I gave have been invited to attended a RAD assessment but the only appointments are for like 1 day away and the centre is about 100 miles away from where I live? RAD slots are released in weekly batches but we always try to have the next four weeks worth of slots in the system. I’d encourage you to book the latest date you can and if you’re unable to attend you can reschedule via the portal up to 24 hours before your RAD. Hi I'm an Ex senior officer left in HMP left in 2013 under VEDS after 22yrs service, looking to re join any tips for the RAD thank you. Best of luck in your application. hello, so ive just passed my RAD, at what point do I make them aware that I'm already SC cleared in refrence to the vetting procedure? Please email the PORRP team as they deal with queries related to vetting - PORRP-VAT@noms.gsi.gov.uk. I have recently applied to re-join the prison service (took VEDS 2013 after 22 yrs) RAD booked for 31/08/2018. Just wondering would i have to go through the current process or is there a form of fast track for re-joiners. Unfortunately no there’s no fast track for re-joiners so you’ll need to go through the process again. What is the difference between reserved list and merit list please? I just received the email that I failed the RAD.how can I know my actual scores on each sections as I did not received any details. You should have received your RAD results by email. If you haven’t received it, you should contact the RAD centre you attended to chase it up. It can take around 5 working days for result emails to be sent. I'm afraid I can't comment on how your RAD tests went but you should be able to know more once you get your scores. I’ve just got my results back from my RAD day, unfortunately I got a C instead of a B for showing understanding on young person specific simulation and C instead of B on assertion for simulation test- is this something I will be likely able to retake? I wasn’t aware which role plays were adult and young person as they did not make it clear on the day, and also I have only applied to an adult prison- not sure if this makes any difference though. Any advice would be great, I’ve tried to call the Holloway RAD centre where I went for advice but cannot get through to anyone. I'm afraid that as per the blog post, you can only retake tests if you've missed the pass mark marginally. You're always welcome to reapply though. Please do keep trying the RAD centre - they can get very busy but they're the best place to ask. Hi I don't know if this is the right place for this question but I'm going to HMP Woodhill a familiarisation visit and I was wondering if there was space to store personal items such as wallets and mobile phones. I am commuting by train and I have no place to store items outside the prison. Yes, there’s a place to put your personal belongings before entering the prison. Staff will show you where to put your items on arrival. Best of luck for your RAD. Is there a urine test on the RAD? A medical test is carried out during the RAD process, this is to make sure candidates are fit and well to take part in the fitness tests at RAD. Unfortunately as blog moderator I don’t hold this information. You’ll be asked about vaccinations as part of the pre-employment health screening process. Could you let me know the total number of marks in the maths test (scored 10, minimum being 9). Just so when I retake my RAD I am fully prepared. I’m afraid we’re not able to go into too much detail about the tests on this public blog. There are 36 questions in total across the role plays and maths test. Please refer back to the above blog post as you’ll find the practice tests there - please have a go at all of them before you go for your RAD retake. I recently attended my RAD, which unfortunately did not lead to a placement. Could you please give me examples of what the assessors are looking for in the Assertion and Respecting others category? I enforced prison rules at all times, respected the equality policy, stood my ground under pressure, remained calm and confident throughout, yet failed on those two competencies. I especially don't know why they failed me on Respecting others, I felt I had done particularly well in that competency actually. Could you please recommend me any ressources to help me prepare, other than the RAD website? Do I have to wait before reapplying? Any other tips for the role play? I’m afraid as blog moderator I don’t hold this information. However, if you review the blog on this page you’ll find that there are suggested practice tests you could take to help prepare. You won’t be able to apply to the same prison where you failed your RAD until this recruitment campaign closes and reopens at a later date. Is it possible to ask to be invited to the coaching sessions mentioned on this blog, for candidates who failed the RAD? Hi Oli, as per the blog if you fail the RAD marginally then you are automatically invited back to try again. Thank you Emily. I haven't heard from HMPS about the development days. Is there someone I can contact to discuss attending one of them? You can only be invited to these days, you’re not able to sign up. HMPPS will be in contact with you if they feel you could benefit from a development day. As per the blog post, you’ll get the opportunity to take another test in the area that you didn’t pass if you missed it marginally. Please refer to the blog post on this page for more information. Hi my name is Michael, I am considering applying to become a Prison Officer. I am 47 years of age. I take prescribed medication for high blood pressure. My blood pressure readings are always within normal parameters now. Would this stop me from becoming a Prison Officer? There is a blood pressure test during the assessment day, but if your medication keeps your blood pressure under a normal level then I believe this should be fine. Additionally, you’ll be asked to fill in a health questionnaire to find out if you’re fit enough for the job. Please make a note on your questionnaire about your prescribed medication so the health team are aware. I’m afraid as blog moderator I don’t hold information about specific RAD/ARC dates. You’ll be contacted as soon as a space and date becomes available. Please keep an eye on both your emails and your portal. I took my on-line tests yesterday.The message in my portal just says "your application is being reviewed" - no mention of pass or fail. Can you help with this please? Please keep checking back onto your portal to see if your status has been updated. Thanks. Have done. It's been updated to awaiting a place at the assessment centre. Hi I'm writing this on behalf of my friend who has just done his RAD day he passed everything but his maths by 2 marks. After they day he was told before leaving by the instructor that he hadent passed his maths but passed everything else he then told my friend that he could not redo his maths and could only re alpy in 6months is this right??? Unfortunately, if your friend has been advised that they are not able to re-sit then I’m afraid this is correct. Development days are not being offered as part of the ARC process unless you fail the fitness test but are close to the pass mark. However if you failed any other element of the ARC you’ll then need to wait 6 months before reapplying again. Hi, I’ve seen people say that they’ve took a CV to the RAD. Is it something that they ask for? Haven’t seen it officially anywhere? No it's not necessary to bring your CV with you to the RAD or ARC. You will be sent an email prior to attending the RAD or ARC detailing exactly what documents you need to bring with you - please do follow this carefully. We are closing down the comments for this blog post as the RAD has now been changed to the Assessment Recruitment Centre (ARC), and since 15 October 2018, no new applicant will be invited to attend a RAD.